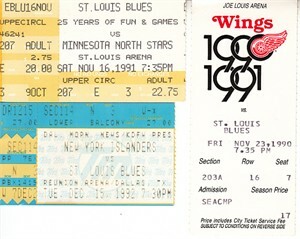 Lot of 3 different St. Louis Blues game ticket stubs: 11/23/90 at Red Wings, 11/16/91 vs North Stars and 12/15/92 vs Islanders in rare neutral site game at Dallas. Brett Hull played in all 3 games. ONLY ONE LOT AVAILABLE FOR SALE.